206 pages | 18 B/W Illus. European macro-regions, Euroregions and other forms of inter-regional, cross-border cooperation have helped to shape new scenarios and new relational spaces which may generate opportunities for economic development, while redefining the political and economic meaning of national borders. This book is based on a number of key case studies which are crucial to understanding the complex web of political, economic and cultural factors that shape the heterogeneous picture of Europe’s new geography. This book provides a fresh view on this phenomenon, with a realistic approach shedding light on its complexity as well as on its ambiguities. The new macro-regions are interpreted with an approach recognizing the importance of institutionalization, but also their flexible configuration and "blurred" borders. 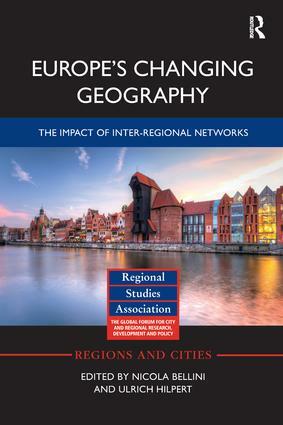 The book also raises the issue of credibility and legitimacy, arguing that inter-regional cooperation has to be removed from the foggy realm of the exchanges between local political and bureaucratic elites in order to be clearly and concretely motivated, and functional to key strategic objectives of the regions. Finally, the authors suggest a complementarity between relations based on proximity and wider (possibly global) networks where some territories, and especially metropolises, find opportunities based on "virtual" proximity. Europe's Changing Geography provides a substantial re-appraisal of a key phenomenon in the process of European integration today. It will be of interest both to scholars of the political economy of European regionalism and to practitioners. Nicola Bellini is Professor of Economics and Management at the Scuola Superiore Sant’Anna in Pisa, Italy. Ulrich Hilpert is Professor and Chair of Comparative Government at Friedrich-Schiller-University, Jena, Germany.